Students from across the world come to St. George’s University for a rewarding education with global impact. 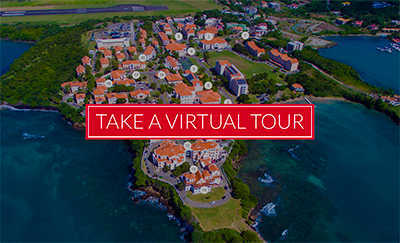 Founded as an independent School of Medicine in 1976, St. George’s University has evolved into a top center of international education, drawing students and faculty from 140 countries to the island of Grenada. The University’s over 20,000 graduates include physicians, veterinarians, scientists, and public health and business professionals across the world. The University offers medical and veterinary degrees in the Schools of Medicine and Veterinary Medicine, and independent and dual graduate degrees in the sciences, public health, and business. Undergraduate degree programs are also available through its School of Arts and Sciences. The University programs are accredited and approved by many governing authorities. St. George’s is affiliated with educational institutions worldwide, including the United States, the United Kingdom, Canada, Australia, and Ireland. Since opening in 1977, more than 20,000 graduates of 52 academic programs have gone into professions and higher education opportunities in over 50 countries throughout the world. First private Caribbean medical school and first medical school accredited by the Caribbean Accreditation Authority for Education in Medicine and other Health Professions (CAAM-HP). SGU students have included nearly 7,000 graduates of institutions found in the US News & World Report’s list of Top National Universities. St. George’s University is the number one provider of physicians to US residency positions in the world. Established in 1976, our world-class MD program opens doors for your medical career on an international scale. We offer premedical and direct entry points that accommodate applicants of all educational systems and academic backgrounds. Skilled patient care on a foundation of focused research. SGU's MD/MSc dual-degree program is designed for medical students with a desire to become involved with original, thesis-oriented research. Choose from one of seven concentrations in the Master of Science (MSc) degree program to focus your area of research. The addition of a MSc degree credential allows medical students to pursue careers in specialty medical practice or in areas of advanced medical research. SGU graduates of the MD/MSc program have gone onto to clinical careers in pediatrics, emergency medicine, internal medicine, family medicine, endocrinology, and advanced research. Where medicine and public health intersect. SGU's dual-degree MD/MPH program expands the clinical viewpoint to consider broader population-based treatment and prevention models. The MD/MPH is ideal for future physicians who want to make a positive impact on public health in the arenas of health policy, health education, biostatistics, environmental health, or epidemiology — while maintaining the skills needed to deliver individual patient care. Graduates of SGU's MD/MPH program move on to pursue roles in clinical practice and management, global outreach, advanced research, medical instruction, and policy organizations. Advance medical knowledge or develop new disease treatments. The MD/PhD degree program from SGU gives you training in both clinical medicine and research methodology. Earn your PhD in one of 14 concentration areas from SGU as you prepare for a career in academia, research institutes, or in industry. Specifically designed for students who want to become research physicians, or medical school instructors, an MD/PhD dual degree gives you the opportunity to perform focused research, in addition to caring for patients. The program includes coursework and intensive training in research methodology leading to the defense of a thesis. Focus your compassion for animals into a professional career of care. SGU's DVM program provides exceptional veterinary medical training and unique clinical opportunities. With flexible entry points into the preveterinary program or a direct entry into the four-year DVM program, students from around the world can begin their path to a rewarding career as a veterinarian. With emphasis on clinical instruction, simulation models, and case-based teaching in state-of-the-art teaching and laboratory facilities, SGU students receive exemplary experiences in preparation for clinical training rotations and for general veterinary practice following graduation. The program offers three years of didactic coursework in basic sciences and introductory clinical work in medicine and surgery in Grenada, followed by a fourth year of clinical training at one of 29 AVMA-accredited affiliated veterinary schools in the United States, United Kingdom, Ireland, Canada, and Australia. The Doctor of Veterinary Medicine/Master of Science (DVM/MSc) dual-degree program gives veterinary medical students the opportunity to conduct original bench and field research. Students enrolled in the dual DVM/degree program complete the DVM degree requirements simultaneously with the MSc requirements, resulting in a DVM degree and an MSc degree in one of nine majors. DVM/MSc students spend the first two summers of the four-year veterinary medical program in Grenada in order to meet the coursework requirements for the MSc program. Under the supervision of an academic advisor and a supervisory committee, students prepare a research project proposal, culminating with a final comprehensive oral examination and defense of the thesis. Combine your clinical skills with a global perspective as a veterinary public health expert. Our dual DVM/MPH degree program addresses key issues affecting the intersection of animal and human health. Earning a dual degree gives the veterinary practitioner the credentials in public health for a competitive edge in the public sector and private practice. Coursework in biostatistics, epidemiology, and health policy and management prepares veterinary students for careers in the study and prevention of contagious diseases, foodborne illness, and bioterrorism. Make a difference in the business of veterinary medicine. With a DVM/MBA in Multi-Sector Health Management (MBA-Health) dual degree, you can gain the business skills to innovate profitable ways to manage veterinary practices without sacrificing the quality of animal care. In tandem with the clinical training as part of the DVM program, the MBA helps students gain the skills to manage research grants, identify gaps in medical care practices, create effective business plans, and administer hospital or insurance company operations. An integrated approach to veterinary medicine and academic research. The Doctor of Philosophy (PhD) degree programs in veterinary medicine lets veterinary students develop focused research leading to a doctoral thesis. Choose from one of nine program tracks, including: anatomical pathology, anatomy, bacteriology, clinical pathology, marine medicine, parasitology, pharmacology, virology, and wildlife conservation medicine. Become more than employable: Be a leader in your community. SGU’s undergraduate degrees provide students with a broad-based knowledge and appreciation of a variety of topics, in addition to a comprehensive professional and scholarly understanding of their chosen major. A clear path for your medical education. A solid foundation in science for entry into clinical training. Establish the foundational science studies needed to prepare for a Doctor of Medicine (MD) or Doctor of Veterinary Medicine (DVM) degree. SGU’s dual-degree program is ideal for premedical and preveterinary students want to pursue a bachelor’s degree before earning an MD or DVM. Gain training and credentials for in-demand careers. Pursue rigorous graduate school studies and research opportunities in a beautiful Caribbean setting. With master's degrees and PhD programs in a variety of specialty areas, you can chart your professional course with a graduate degree from SGU. Supported by more than 100 full-time faculty members, you can develop in-depth research projects and critical skills needed across the globe. Build on your clinical skills to broaden your professional opportunities. Our dual-degree veterinary programs let you complete your DVM degree in tandem with a master’s degree to focus your animal health care research and areas of public policy. Push your boundaries with an exciting study abroad program that lets you complete one year of your basic sciences at Northumbria University in the UK. The KBTGSP is an ideal international program for medical students who wish to earn a Doctor of Medicine and want to devote at least a portion of their professional lives to the service of developing countries and underserved regions of the world. The IVSP is a summer research program ideal for veterinary students with little or no research experience. Paired with a skilled mentor, you will be encouraged to develop independent research skills and collaborate with fellow researchers and students at our beautiful True Blue campus in Grenada. As a medical school with a worldwide mission, SGU draws students and faculty from more than 140 countries who want to incorporate a multicultural perspective into their medical careers for a truly global impact. Our School of Veterinary Medicine proves that excellence knows no boundaries. SGU has graduated more than 1,200 outstanding veterinarians into the global health care system within the past two decades. Our School of Arts and Sciences helps you gain professional skills in undergraduate degree, dual-degree, and postbaccalaureate premedical programs. You can apply your knowledge in internships and service-learning opportunities. SGU’s graduate degree programs keep pace with the evolving needs of business, public health, research, information science, and veterinary medical care with 100 full-time faculty members at our beautiful campus in Grenada.